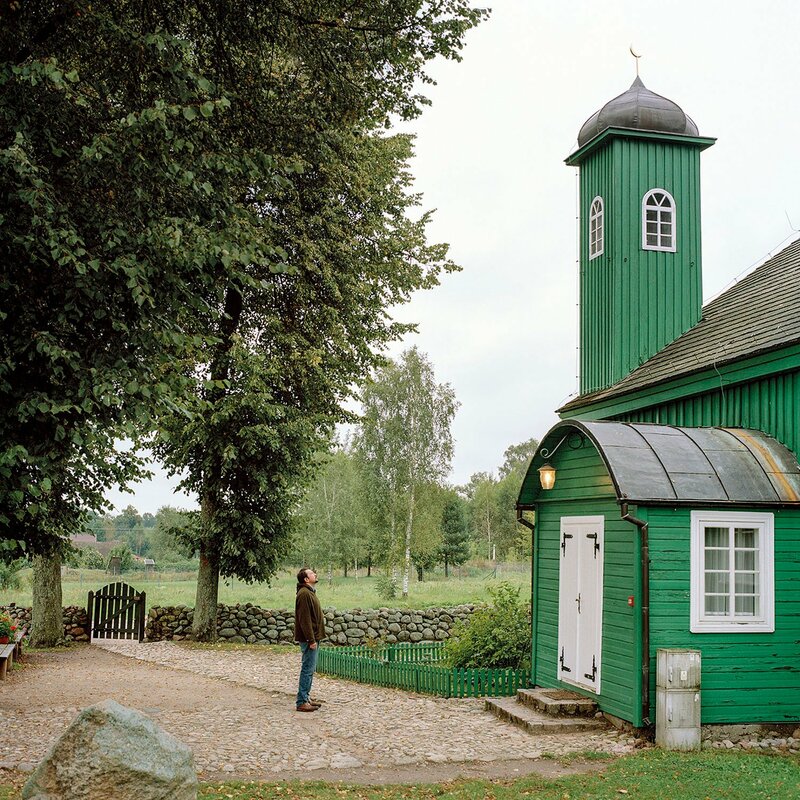 The Podlasie region of north-eastern Poland is home to a small Sunni Muslim community called Polish Tatars or Lipka Tatars, who have settled there for over 300 years. 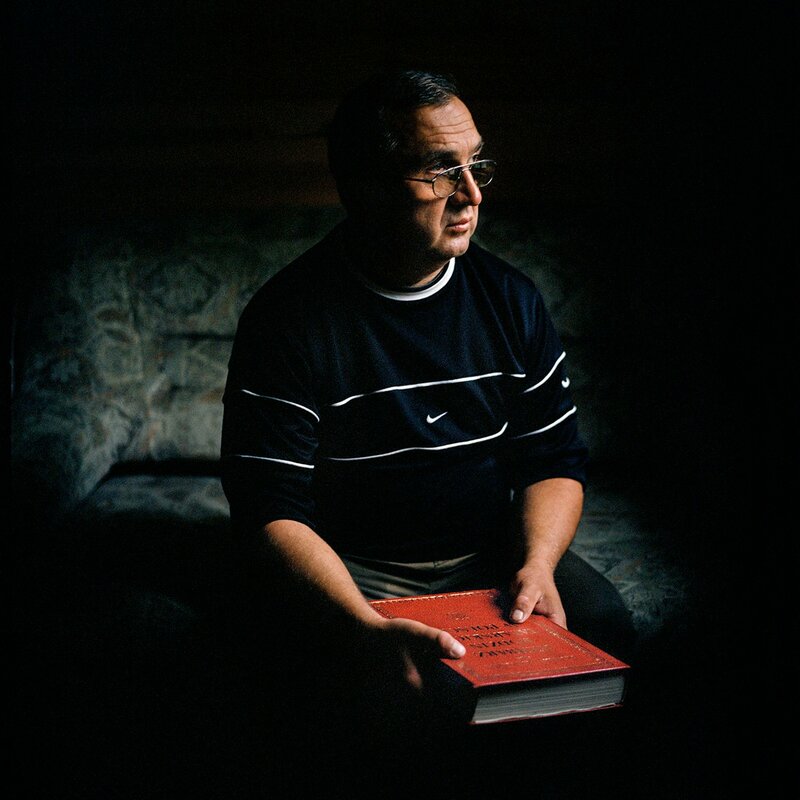 Photographer Selim Korycki is one of the 3000 Poles with Tatar heritage. For centuries, the Tatar relatives on his father’s side resided in what is known today as the Grodno Region of Belarus. Like many other Tatar people unable to return to their ancestral land after the Second World War, his family relocated to Gdansk. Many other Polish Tatars moved to Wroclaw, Szczecin, Gorzow Wielkopolski and Bialystok. 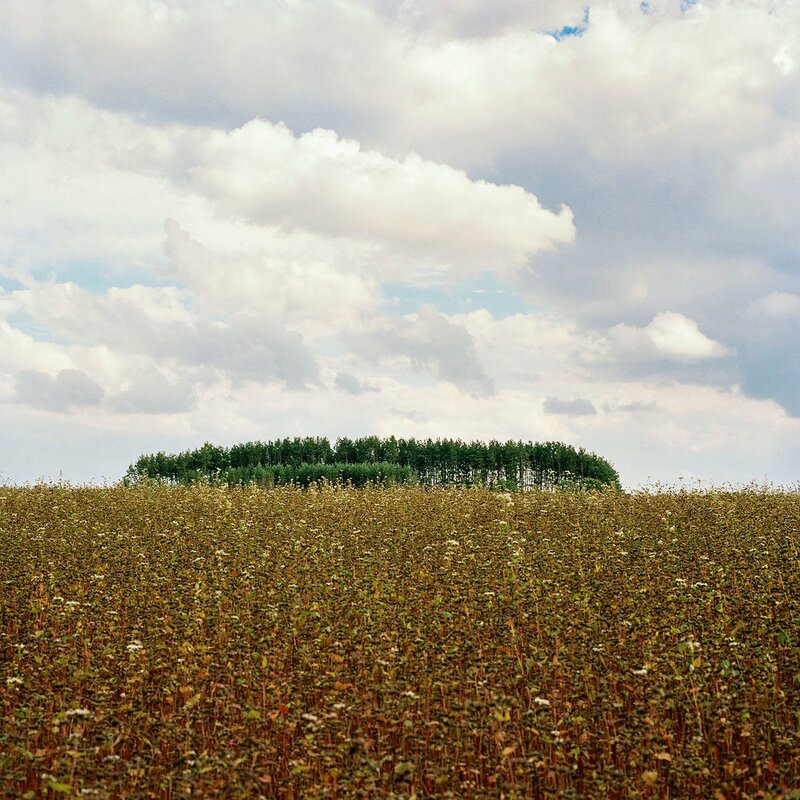 Last year, he started to investigate his family history and the existing community of Polish Tatars in north-eastern Poland. “Despite being brought up as an atheist, I was always very aware of my family history as well as the history of Lipka Tatars. Following many discussions about rising nationalism and Islamophobia, I realised just how very few people are aware of the Muslim community peacefully settled in the heart of Europe for over 600 years. Knowing that Podlasie region is the only place within today’s Polish borders where Tatars not only lived for generations, but are still present today I decided to execute the project there. This was my first visit to the region,” says Korycki, who shot his project The Waning Crescent during the summer of 2017. 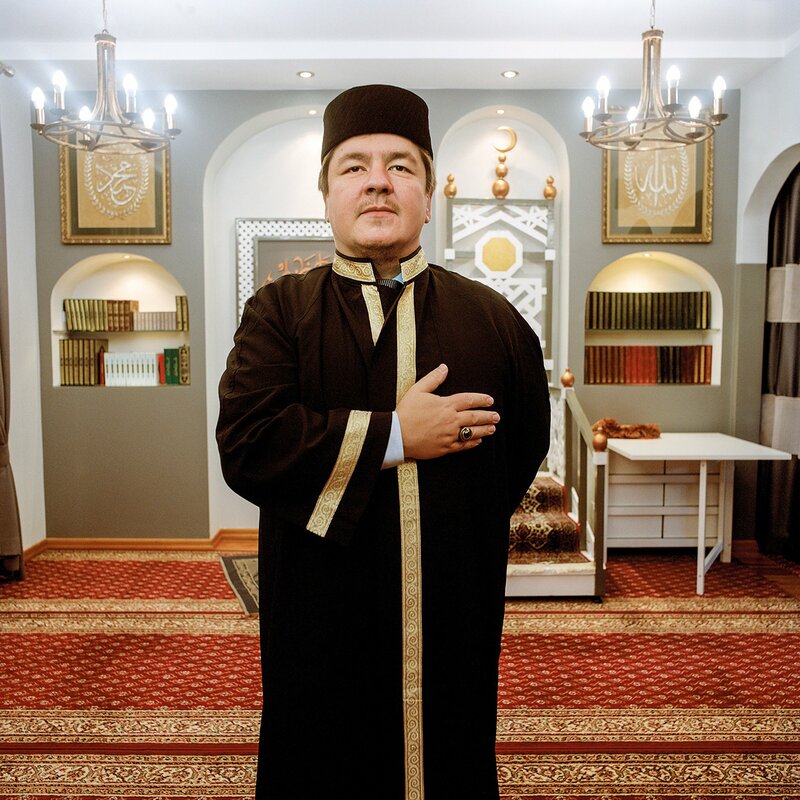 There are a lot of misconceptions about Lipka Tatars in his home country. 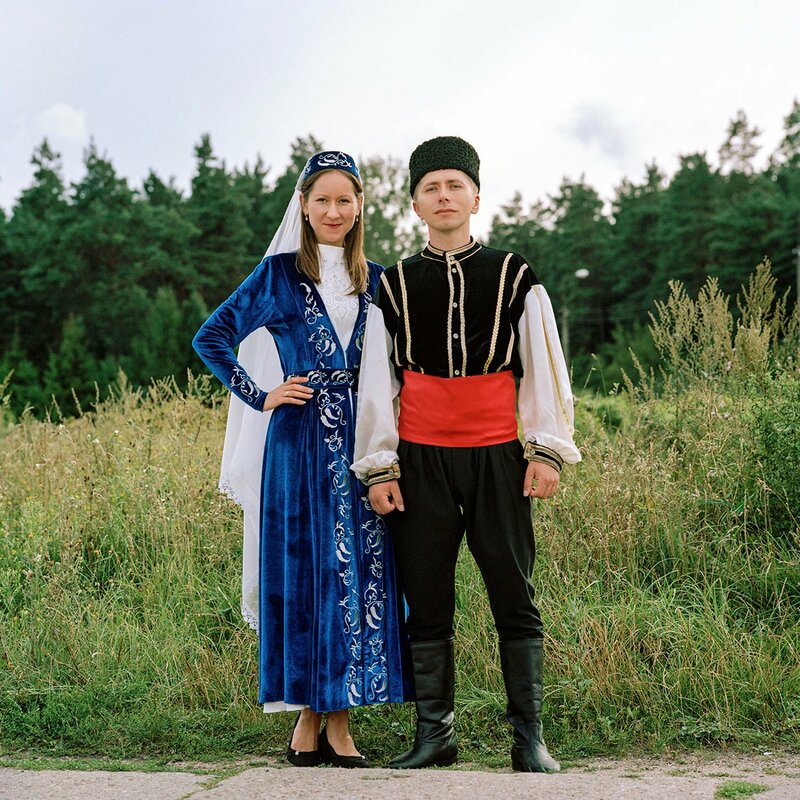 “There is a belief, for example, that Polish Tatars look like Mongolian nomads, that they speak ‘another’ language, and are generally un-Polish. 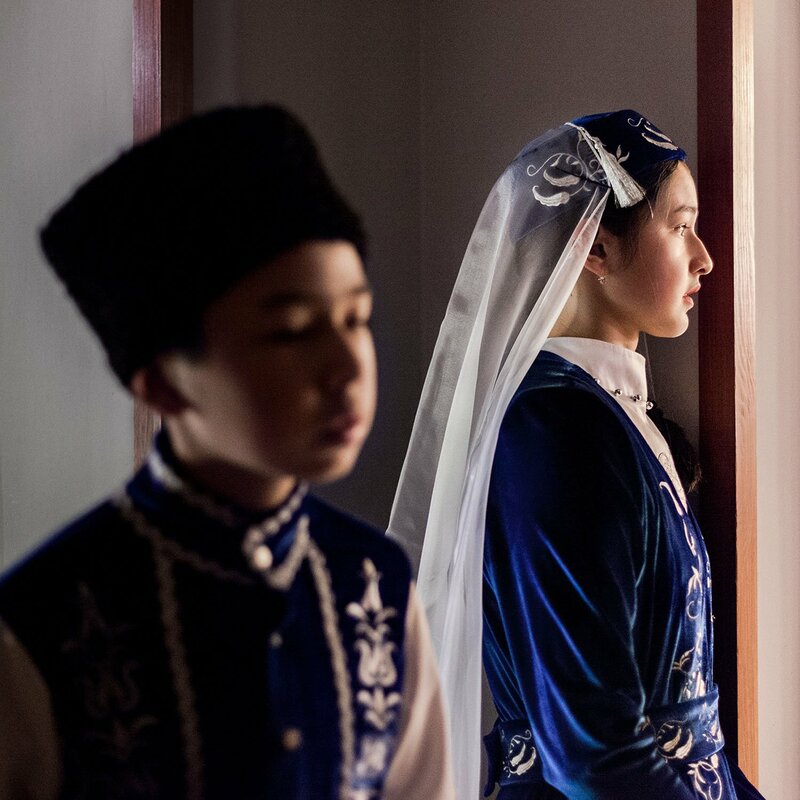 In reality, after 600 years of assimilation, Poles of Tatar heritage are mostly undistinguishable from the rest of the population. Just as their parents, their grandparents and their great-grandparents they speak Polish, think Polish, feel Polish, have Polish surnames, eat Polish food.” At the same time Polish Tatars cultivate their culture by practicing Islam, preserving traditional Turkic names, and nurturing traditional Tatar cuisine (Central Asian dishes with Eastern European influence). Dżemil Gembicki, caretaker of Kruszyniany mosque, prepares to open the temple on an early autumn morning. The village of Kruszyniany was one of the places where Lipka Tatars first settled in 1679 following a royal decree granting several privileges to loyal Muslim soldiers. 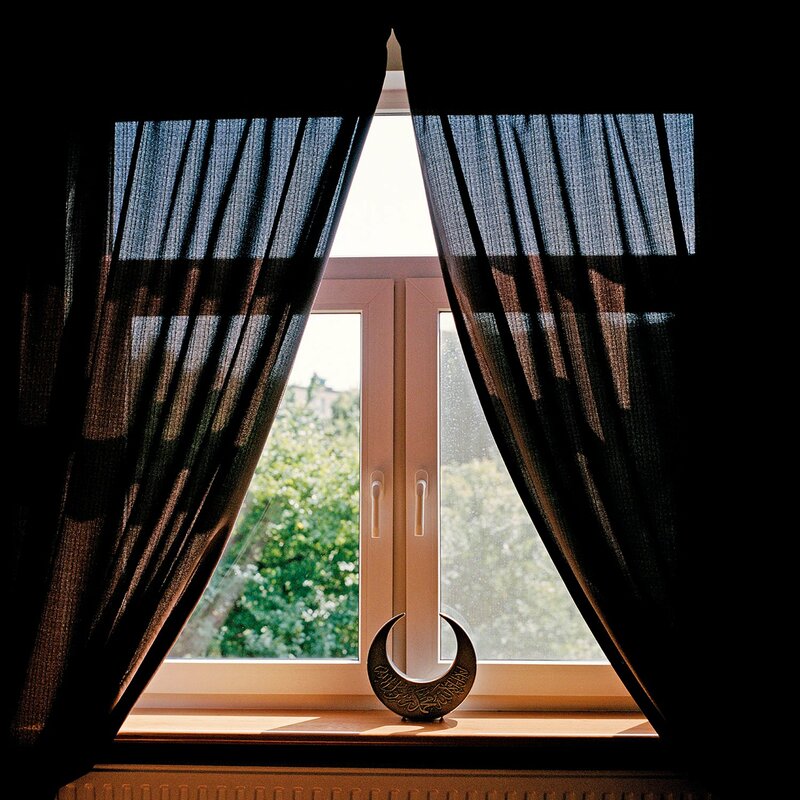 A decorative crescent moon ornament on the window ledge at the Muftiate office in Białystok. The Gembicki family at home. 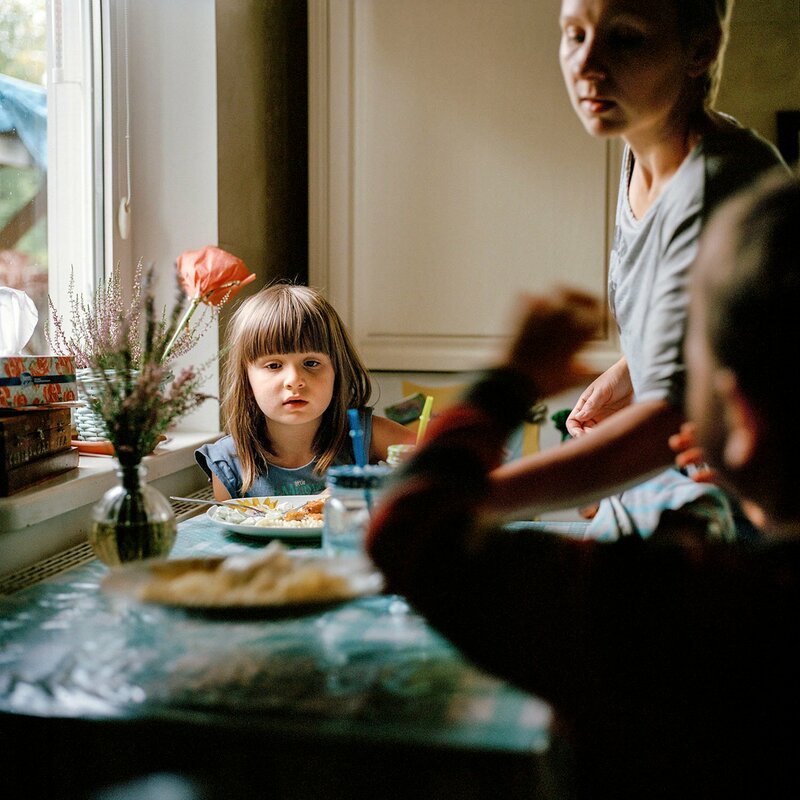 Kasia serves lunch to their children Lilia and Selim. Dżemil is a Muslim and Kasia is a Catholic. The conundrum that many mixed religion families face when choosing a faith for their children was easily solved: Lilia is brought up as Catholic and Selim as Muslim. Eugenia Radkiewicz is the guide at Bohoniki mosque. 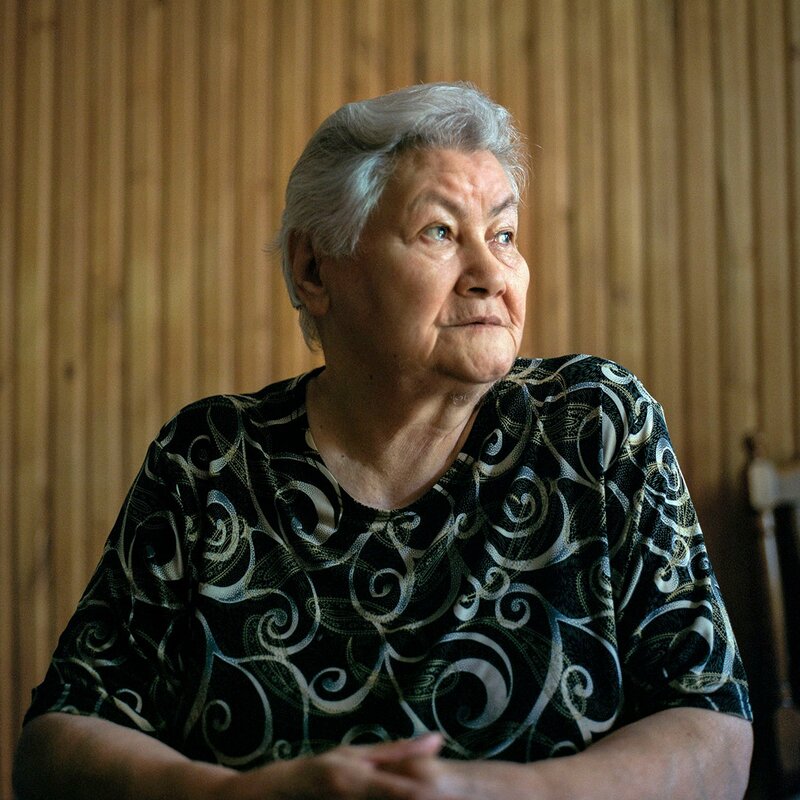 Her parents, Lipka Tatars from Lithuania, moved to Podlasie at the end of the Second World War to join their extended family. They settled in the village of Malawicze, a few kilometres from Bohoniki. The 13th Cavalry Regiment of the Polish Army was formed in 1930 and from the very start its First Squadron was partly staffed by Muslims (Polish Tatars as well as escapees from Bolshevik Russia). The word ‘Tatar’ was officially added to the squadron’s name in 1936 and any Polish Lipka called up for military service was most likely to be serving in the First Squadron. 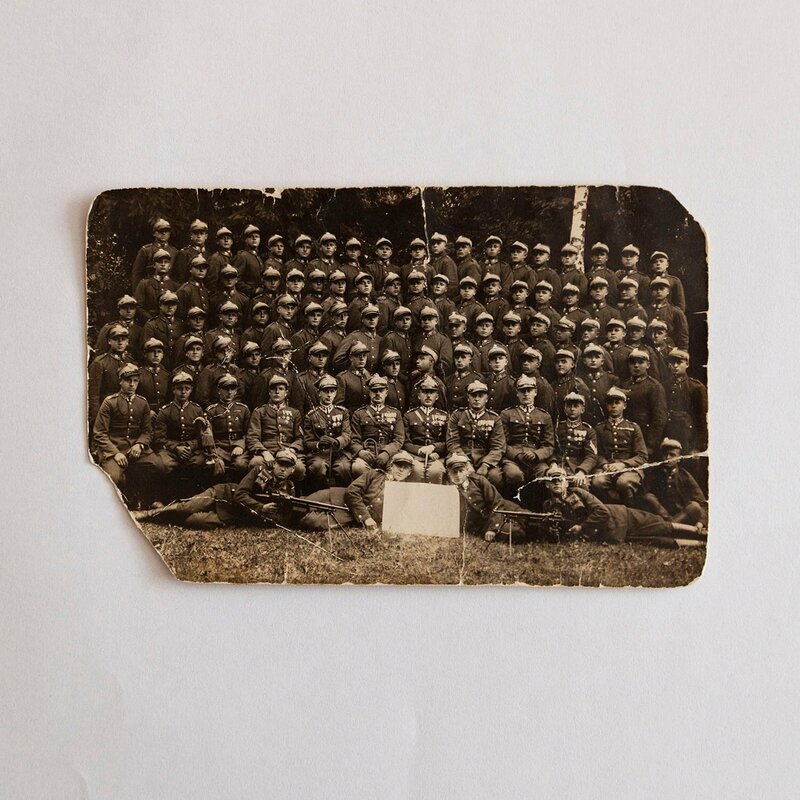 Pictured is an archival image of the First Tatar Squadron at the 13th Cavalry Regiment’s barracks in Nowa Wilejka (in todays Lithuania) taken in July 1937. Land near the villages of Drahle and Bohoniki received in 1679 by Muslim Lipka soldiers by royal decree from King Jan III Sobieski. Throughout the 17th century the Kingdom of Poland was engaged in a series of wars with expanding Ottoman Empire. During the reign of Jan III Sobieski, Poland achieved some major victories, one of which was the Battle of Vienna in 1683. The irony is that in highly xenophobic and anti-Islamic climate of today’s Poland, the Battle of Vienna is often portrayed as the clash between Europe and Islam, and ultimate historical proof that Poland was always anti-Islam. Unsurprisingly the fact that Polish Muslim soldiers fought on the Polish side is rarely mentioned. 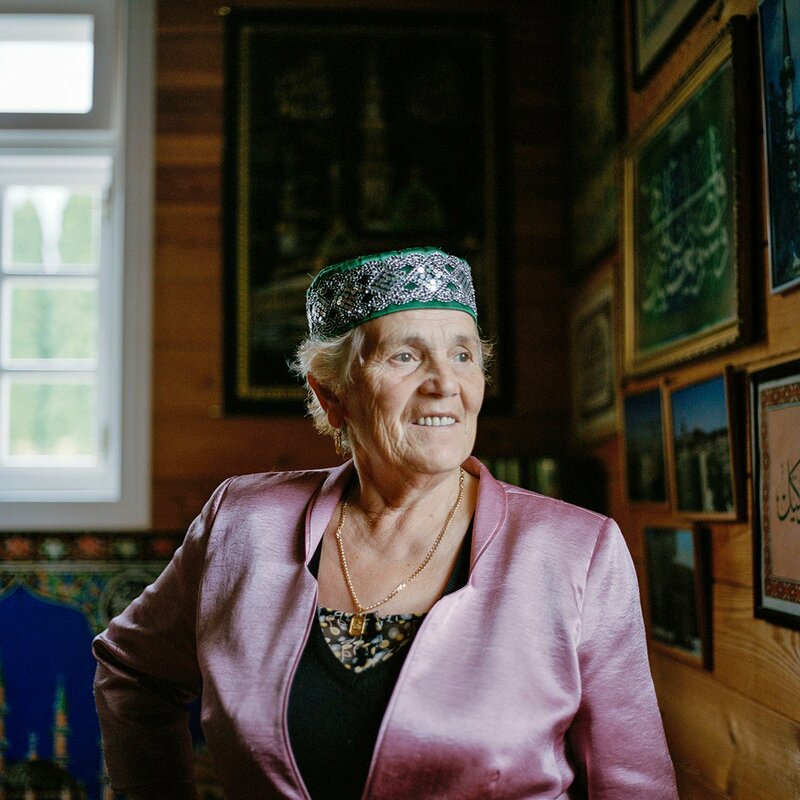 Although now retired, Halina Szahidewicz is still the bedrock of the Polish Tatar community in Białystok. Her family came to Podlasie from today’s Belarus after the Second World War. Halina worked as a teacher for many years. She was also a long-standing chair of the Muslim Religious Association of Poland, co-founder of Poland’s Joint Council of Catholics and Muslims, and the 2010 recipient of the Person of Dialogue award, given annually to those promoting dialogue among different religions. In 1999 Halina single-handedly intitiated youth band Buńczuk, which is active to this day. “Witaj Szkoło!” Welcome to school! Every child in Poland is greeted by this sentence in early September when school commences after the summer holidays. Although religious education is not compulsory in Poland, a vast majority of school children attend classes of religion, usually run by a Catholic priest/nun (sometimes, if enough parents/students request it, lessons of ethics are taught). Muslim pupils usually aren’t as lucky as the kids in Białystok, where the local Muslim Religious Association in co-operation with Białystok’s education board and the Muftiate Religious Association organises Islam classes. The children who attend are a mix of Polish and Crimean Tatars and Chechen refugees. Pictured is Mirza, a local imam, who is leading a prayer class to a mixed group of boys and girls. Bridge over Mahomet. View on a water reservoir from the bridge over Mahomet River near Siemiatycze. The map of north-eastern Poland is dotted with hamlets and places deriving their names from Tatars and their culture. Many of those names are completely Polonised and only a knowledgeable researcher can point to their Muslim or Asian etymology. Few others are unmistakably influenced by Islam, and the Mahomet River is the best example. Mufti of Poland Tomasz Miśkiewicz in the prayer room of the Muslim Religious Association in Białystok. The title of Mufti is given to an educated Muslim who is qualifed to give advice on applications of religious law in all aspects of everyday life. Miśkiewicz, a Polish Tatar from Podlasie, is the second Mufti in the history of Poland holding his office since 2004. The first Polish Mufti Jakub Szynkiewicz (also a Lipka Tatar) took the title in 1925. Szynkiewicz lived in exile from 1945 and died in the USA in 1966. Derelict house in Kruszyniany. 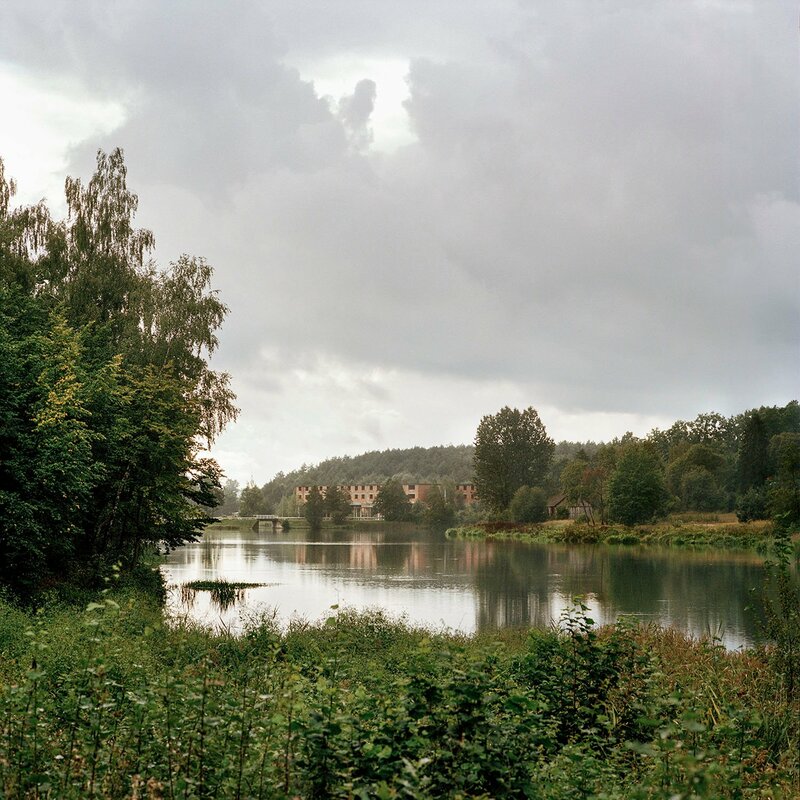 Just like many hamlets in Podlasie, Kruszyniany – traditionally inhabited by Tatars – has suffered from a steady flight of inhabitants moving out to larger towns and cities. Offcial figures from 2006 account for just 160 inhabitants living in the village (down from nearly 300 in 1980). 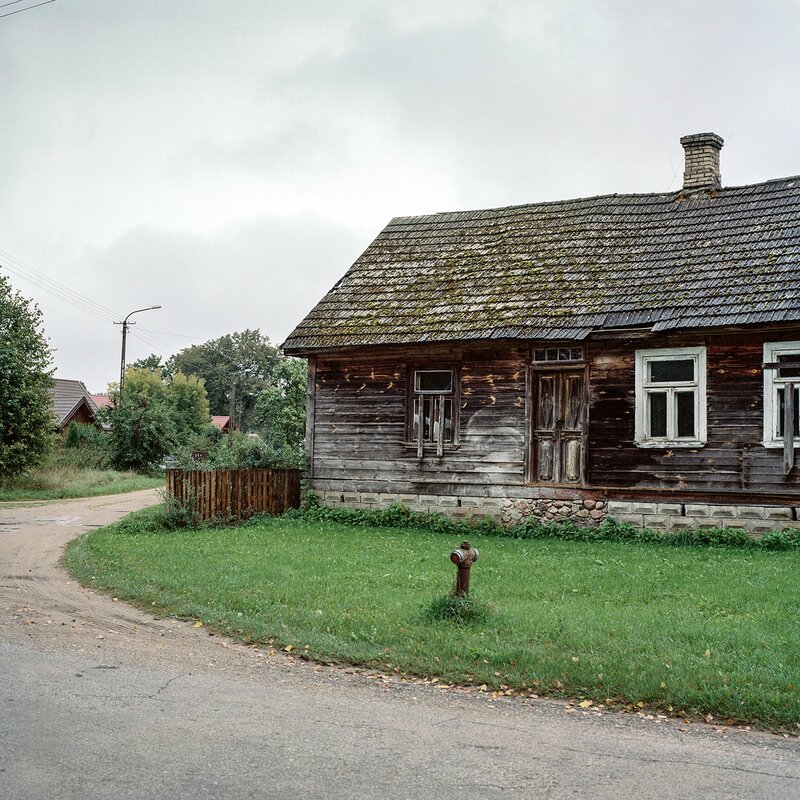 Growing interest in Tatar culture and a flow of tourists to Podlasie in the summer months means that things are slowly changing and abandoned houses may one day become a rarity. Moments of anxiety before a live performance. Emilia and Selim Mucharscy are part of Buńczuk — a Tatar dance and song band. Buńczuk has been active for nearly two decades and the band’s repertoire links Lipkas’ Eastern European culture with their Asian roots. The band performs dances based on Crimean, Bashkir and Tatarstan traditions, alongside Islamic religious songs and Polish poetry. Over the years more than 70 young people were involved with Buńczuk. Adam Iljasiewicz at his home in Kruszyniany holding the seminal 1928 volume The Armorial of Tatar Families in Poland. The Iljasiewicz family, just as many other Polish Tatar families, held nobility titles. This heritage is often cherished to this day. The Iljasiewicz family identifies by the Leliwa coat of arms. Elwira and Stefan Szahidewicze performing with Buńczuk. Elwira and Stefan were one of the first among Tatar youth who were involved with the band. They since married and occasionally perform with Buńczuk. 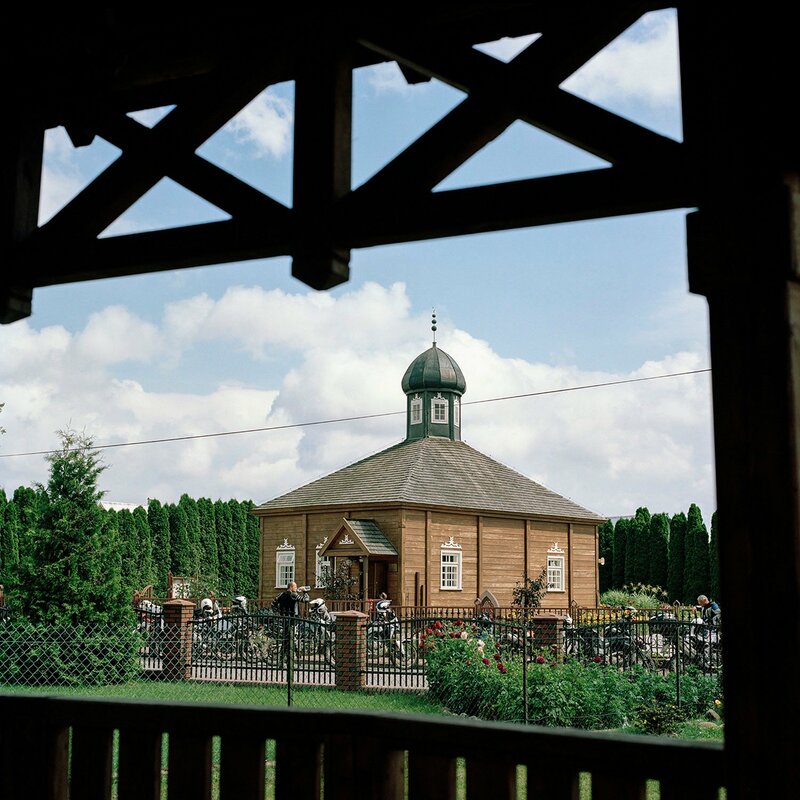 A group of touring motorcyclists stop to visit a wooden mosque in Bohoniki. The mosque was built in the late 19th century following the fire that consumed the previous, late 17th-century building. 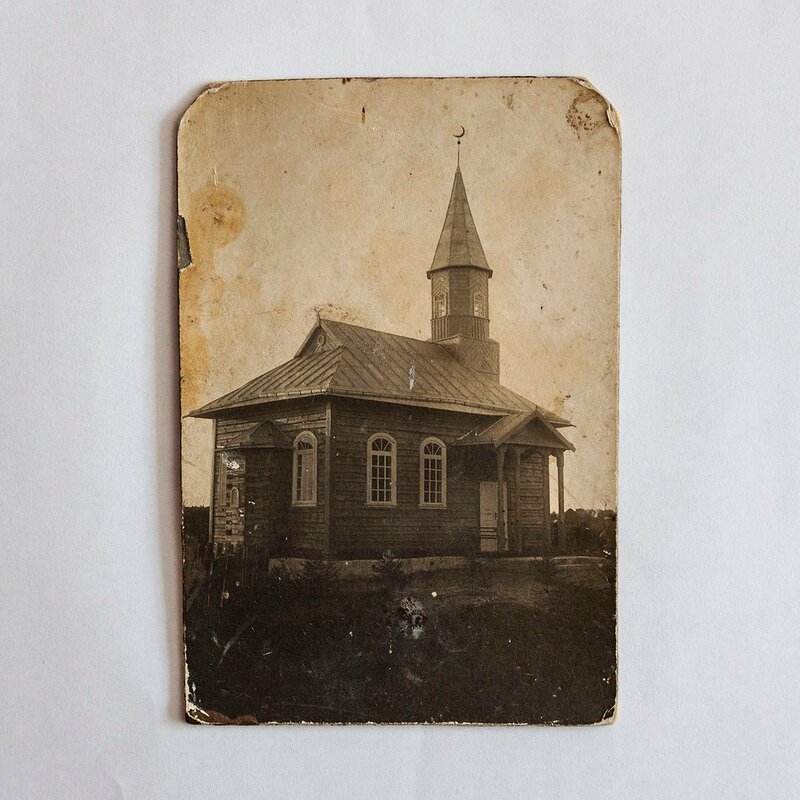 Lipka Tatars –– soldiers and skilled horsemen –– were lacking skills needed to construct a wooden temple and usually employed local craftsmen to build mosques. Buildings would be adapted and modified for requirements of the faith, but the overall look and style remained similar to Christian temples in the area. A 1930s postcard of the mosque in Niekraszuńce in today’s Belarus. The village of Niekraszuńce was one of the first places where Lipka Tatars settled in the 14th century. The existence of a mosque there was first mentioned in 1415. Over the centuries few mosques were built, the last one was erected in the 1920s and demolished by the Soviets in the 1950s. Many Polish Tatars’ roots connect them with Niekraszuńce.